Visitors take pictures with the Bumblebee Autobot character from the Transformers movies at the Universal Studios Hollywood theme park in Hollywood. GM’s relationship with Transformers goes back to the first film in 2007, which included Bumblebee, a bright yellow Chevrolet Camaro. As “Transformers: Age of Extinction” opens in theaters, General Motors Co. (GM) is betting on the latest installment of the alien-robot saga to help jump-start Chevrolet sales in China. The reboot of the movie franchise, which features battling robots that convert into cars and trucks, opens in China and the U.S. today and includes vehicles such as the Chevrolet Camaro sports car and Trax small sport-utility vehicle. The fourth movie in the series gives GM, second to Volkswagen AG in sales among foreign automakers in China, a marketing tool as it introduces six Chevrolets in the country this year. The goal “is to use it as a springboard for launching new products,” Tim Mahoney, the global chief marketing officer for the Chevrolet brand, said last week in an interview. The brand could use a boost in China. Chevrolet last year failed to keep pace with the nation’s 16 percent growth for passenger vehicles, with sales rising 8.5 percent to 652,077. 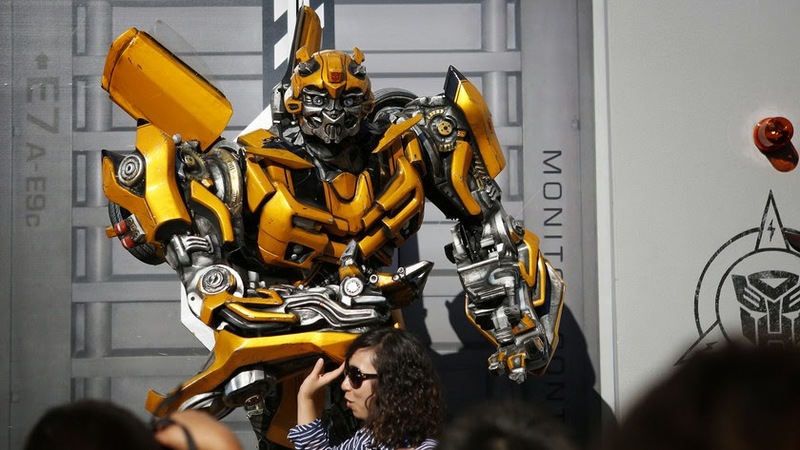 Transformers has melded the summer popcorn spectacle with U.S. car culture in a way that has resonated in China, where its middle class has been fueling the world’s largest auto market. GM’s relationship with Transformers goes back to the first film in 2007, which included a bright yellow Chevrolet Camaro called Bumblebee. Mahoney said he’s seen the effect of the movie on the streets of China, where more than 70 percent of Camaro sports cars are purchased in the same color as the character. In the U.S., it’s just 5 percent. “The yellow is pretty well associated with Chevy and I think a lot of it, I can’t prove it, but I suspect a lot of it has to do with the role Bumblebee played,” he said. GM, based in Detroit, plans to use Chevrolet to expand into China’s smaller cities and the country’s western region. The brand’s slower growth last year came “from not having the freshest product in the highest growth segments,” Bill Russo, president of Synergistics Ltd., a Shanghai-based consulting firm, said in an e-mail. Cristi Vazquez, a GM spokeswoman, declined to say how much GM spent to be part of the movie. The favorable exposure in the Asian nation could be a boon for GM as the automaker plays defense in the U.S. over its handling of a recall of 2.59 million small cars with ignition issues linked to at least 13 deaths. Ed Welburn, GM’s head of design, said he’s noticed the Transformer logo on Chevys while riding through Shanghai. GM is betting that the latest film, which features a cast led by Mark Wahlberg, will have a similar impact in China. The first three pictures in the franchise have generated $2.67 billion worldwide for Viacom Inc.’s Paramount Pictures, according to Box Office Mojo. The last installment, “Transformers: Dark of the Moon,” was released in 2011 and had the second-biggest opening weekend for a U.S. film in China, pulling in $56 million, and ending with total sales of $165 million. The number of theater screens in China tripled from 2008 to 2012, reaching 13,118, according to Beijing-based EntGroup, a research firm. Box-office receipts climbed 36 percent from 2011 to 2012 to reach $2.7 billion and surged to $3.6 billion last year, data from Rentrak show. Welburn, the design chief, worked closely with the filmmakers and has a cameo role in the movie. A GM plant was also used as a set, according to LeeAnne Stables, president of Paramount consumer products and executive of worldwide marketing partnerships. The relationship saw GM push to get its new Trax SUV, which went on sale in China this year, in the movie along with the Sonic small car. The Trax is an important introduction for GM in China, where the brand has fallen behind in the small SUV segment. The automaker and its joint-venture partners reported overall sales gains of 11 percent to 3.16 million in China last year. GM sold 809,918 Buicks in China in 2013 while its Wuling truck brand delivered 1.48 million vehicles domestically. GM isn’t the only automaker counting on the Transformers movie. Guangzhou Automobile Group Co., whose Trumpchi GA5 sedan is driven by actress Li Bingbing in the film, plans to export the Chinese brand to the U.S. as early as next year. China has become the first country to reach more than 20 million new vehicle sales in one year with deliveries rising 14 percent to 21.98 million in 2013. Sales may exceed 24 million in 2014, the state-backed China Association of Automobile Manufacturers has said. Last year’s sales of passenger vehicles, excluding buses and commercial trucks, climbed to 17.93 million -- or 15 percent more than the U.S. auto industry -- and may increase 9 percent to 11 percent this year, the association said. As GM works to build Chevy in China, the latest movie arrives with not only cast members from China but also some filming done in Hong Kong as Hollywood also tries to capture a growing market. Back in Detroit, Welburn, the design chief, said he believes the Camaro’s success in the movie is simple.